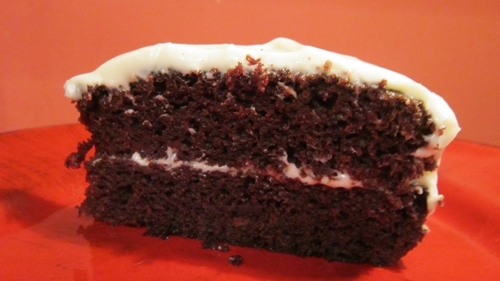 Not many desserts are better than a delicious, moist chocolate cake with a creamy icing, unless you add tangy, creamy guinness stout to the batter. Then, you have perfection! This is a dense, rich cake that works with any kind of good, dark porter or stout. Why not try it as an alternative to the traditional pies and xmas puddings, your family and quests will be truly impressed! It will keep up to a week in the refrigerator in an airtight container. Enjoy! Combine 1 cup guinness and 10 Tbl. butter in a pot and heat until butter melts. Remove from heat and add 3/8 cup cocoa, 2 cups sugar, Beat until well blended. In another bowl beat together 3/8 cup sour cream, 2 large eggs and 1 Tbl. vanilla. Add to guinness batter. Add 2 cups sifted white plain flour and 2 1/2 tsp. baking soda and mix well. Pour into a greased 9″springform pan. Bake 45 minutes to 1 hour. Remove from oven and cool on a wire rack. When it is cooled, take a long, sharp knife and slice the cake in half through the middle. Lift off the top half, ice the bottom half and replace the top. Ice the top and sides. In a mixer or food processor combine 1 1/4 cup icing sugar, 8oz. cream cheese and 1/2 cup heavy cream. Ice cake when it is cooled completely.